CarMel would like to introduce our two new Versatility Champions in 2014! 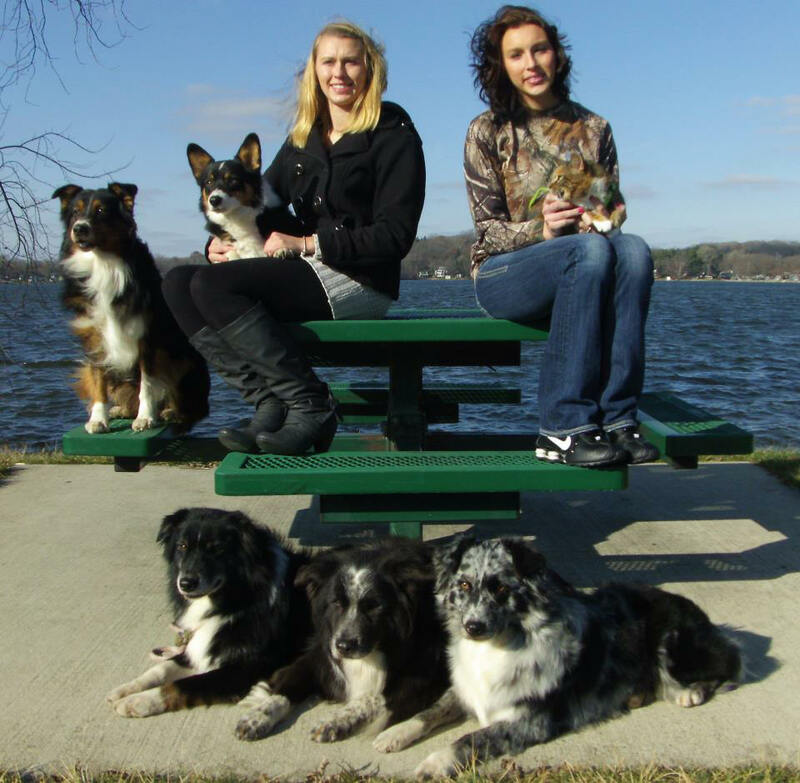 VCH WTCH CH Diamond Aire New Moon RE CDX OFTDsm RTDs "Quil"
VCH WTCH CH Diamond Aire Midnite Smoke RM CDX AFTDs OFTDdm RTDsc "Smoke"
CarMel Kennel is a small kennel focused on breeding Australian Shepherds that can successfully compete in ALL arenas. The kennel is family run and started with the purchase of a blue merle male named "Jazz" (Diamond Aire CarMel Jazzberry CD) from Marie Murphy of Diamond Aire Kennel in 1984. His brother "Leo" (Ch Night Life of Wynd Chyme CD) joined us later and sired our first litter. Often times our dogs go directly from the stock arena into the conformation ring or vice versa without missing a beat. We have dogs that have won HIT stock , HIT obedience , and BOB. Some have even won two or all three of these awards. Our lines are based on the well established lines of Diamond Aire Kennel. We do not follow the "fads" of the conformation ring so our dogs are chosen for their sound structure, moderacy, correct breed type, intelligence, instinct, and of course health. All of our breeding dogs are OFA Good-Excellent and have their eyes cleared annually. We are VERY open about any health issues our lines may carry a risk for, but we have so far been blessed with very healthy lines. We breed for dogs that can truly be versatile and compete in whatever their owners want then go home and sleep on the couch. Moderacy is the key word in our standard, and our dogs are truly moderate in coat and bone. They are both beautiful and useful as we believe form follows function and they should be able to do the work of their ancestors both physically AND mentally. We have a very limited amount of litters, and don't keep very many dogs so that they all have a chance to be worked. However, we are more than willing to help people find the right Aussie for them through both our breeder and rescue contacts. We currently compete in Conformation, stock dog trials, obedience, and rally. We are also dabbling in tracking, and during the winter all of the dogs enjoy pulling our Canadian kick sled or skijoring. While we have produced very few litters over the years, we have been blessed with many talented dogs that have competed successfully in multiple venues. Most of these dogs are/were owned by us or Marie Murphy of Diamond Aire Kennel. We greatly appreciate the work put into these wonderful dogs!